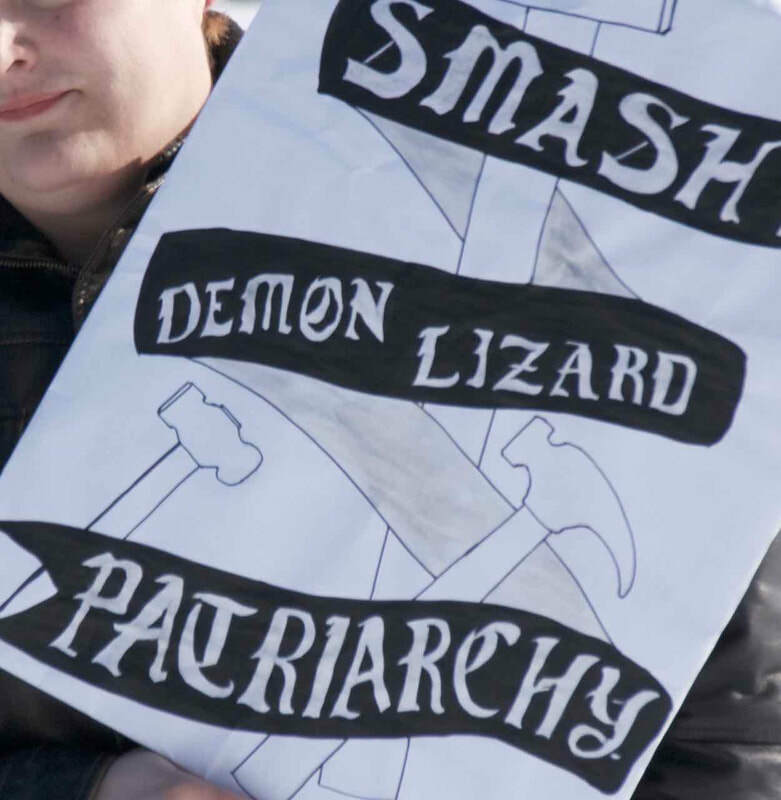 Here are photos, text, and comments from the 2018 march​. 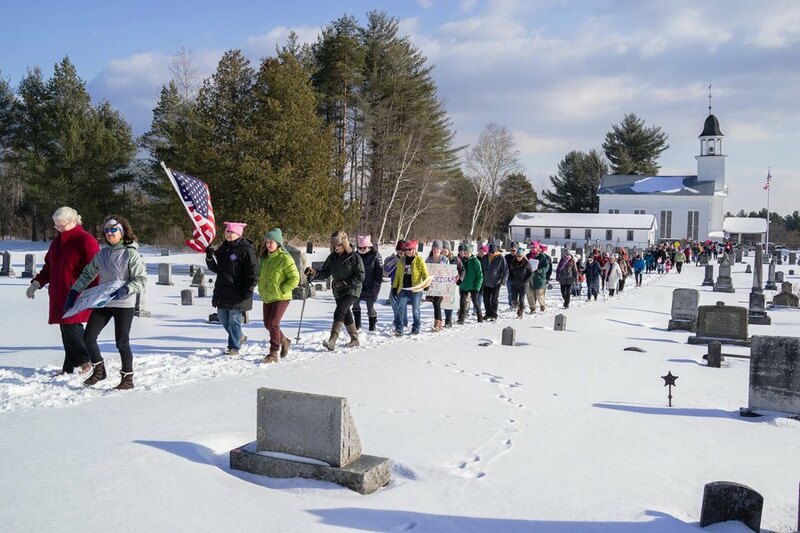 Sun Community News, "Adirondack March Draws Hundreds to Lewis"
Plattsburgh Press Republican, "Not Just for Decoration"
The national press release for the 1@1 Moment of Silence for Women's Equality mentioned some large marches, and then noted some smaller marches. 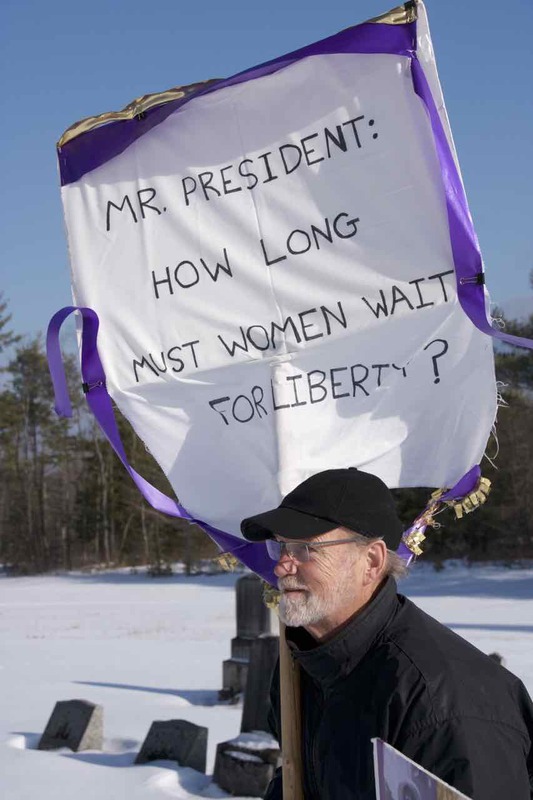 "....At the exact same time, some of the smallest but most passionate Marches are linking: Rabun County, GA (50); Apartment Lounge, Grand Rapids, MI; and marchers at the gravesite of Inez Millholland, in Lewis, NY, the kickass Suffragette born 100 years ahead of her time...."
I have no words to express the tremendous energy and spirit of every single child, youth, woman, and man who marched up the hill to the grave of Inez Milholland. You are per-sisters. Forward! Sunny, near 40 degrees, and a mighty wind carrying our voices to the hills. 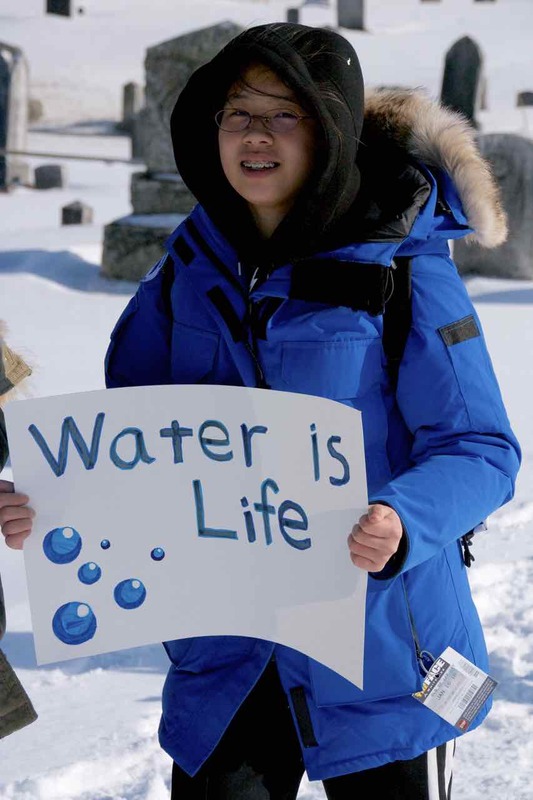 Yesterday was a true group effort, from every marcher, singer, and speakers at the Parish Hall. A few people donated materials, food, drinks, and time. Without their support and enthusiasm, the event would not be what it was. Christina Holland (and sister and nephew), Sebastion (our chef), Susan Peterson Arnold and Glenn Arnold, Michelle and Lenny Zelkowitz, Patience Whitman, Cheri Cross, Martha Wheelock, the Town of Lewis, Kathy Linker, Suzie Dubay, and David Hodges. 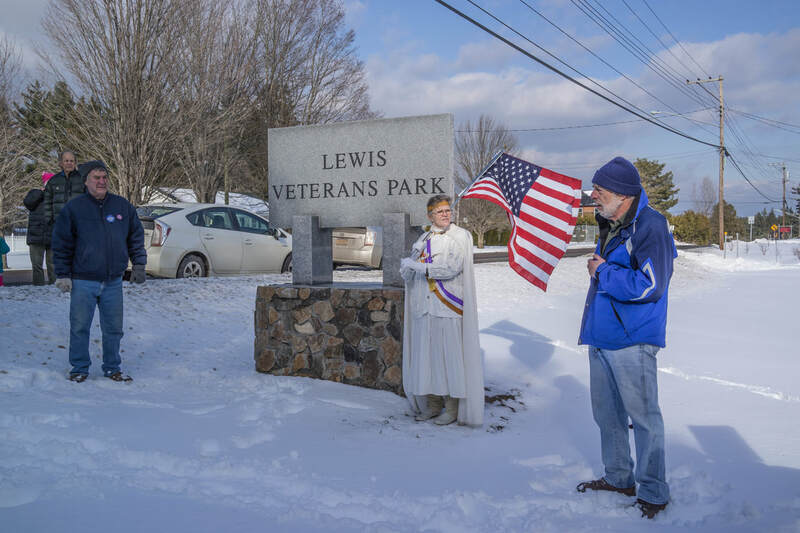 Also, because of everyone's generosity yesterday, we were able to give $100 to the Lewis Church and $100 to the Lewis Veterans Park (towards its completion). ​they are available for $15 or 2 for $25. Once again we will meet at the grave of Inez Milholland. 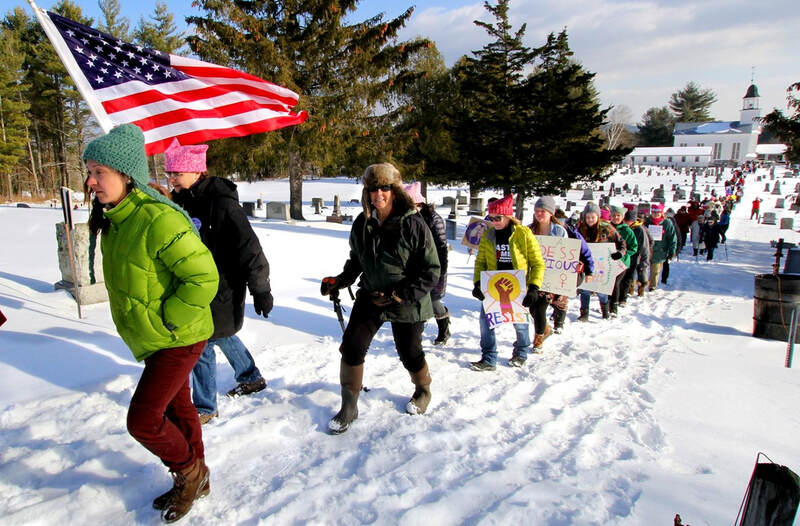 Second annual Women's March at the grave of Inez Milholland. It has been a year...and we need to come together in solidarity again! Everyone is welcomed and the event is free. Please join us and make your voice heard! 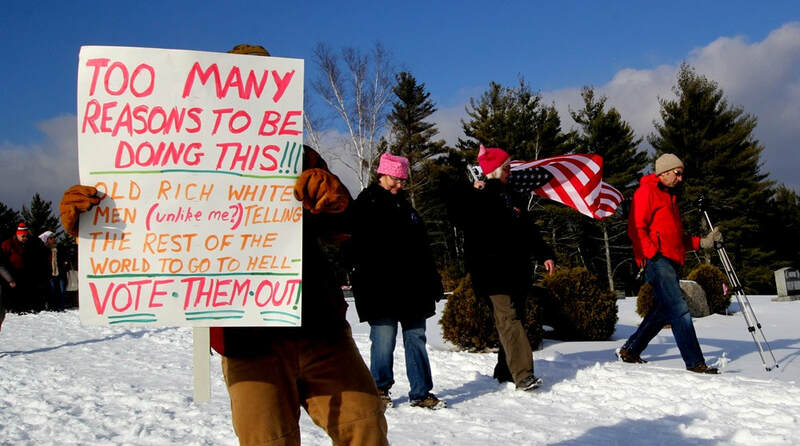 The Adirondack Women’s March will take place on Saturday, January 20, 2018, to show solidarity with women around the world. 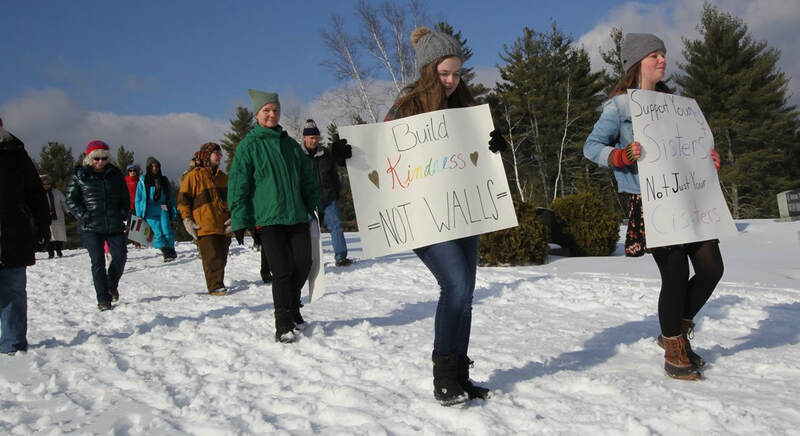 Vibrant and diverse communities are the strength of our country and we will stand together to protect the civil rights, safety, and health of all. We call on all defenders of human rights to join us at this peaceful, non-partisan event. Solidarity means supporting and taking collective action for a common aim. It does not mean that we will agree on everything; we are a coalition of organizations and individuals. Unity of purpose, yes! Diversity of focus and strategy, yes! Sense of humor, certainly! 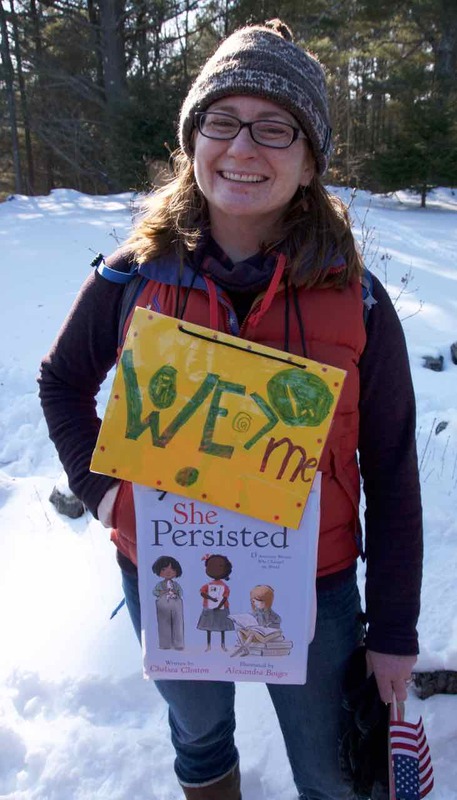 The focus of the Adirondack rally is Inez Milholland, and the Town of Lewis is graciously assisting with the event. As the herald on a white horse in the 1913 Suffrage Parade in Washington, Inez Milholland symbolized the strength, power, and courage of women and led them Forward into Light. Three years later, she became the martyr and inspiration for suffragists after dying while campaigning for Votes for Women. 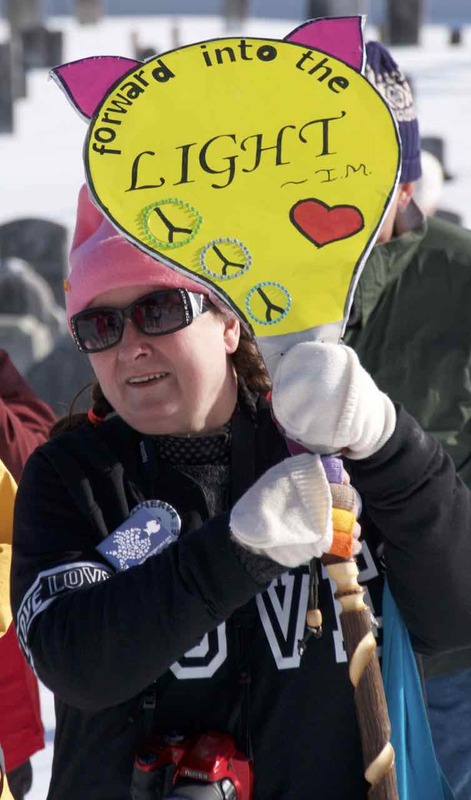 On January 20, we will gather in Lewis for a celebration of Inez and all advocates of human rights. “Forward Into Light,” the 12-minute film produced by Martha Wheelock about the life of Inez Milholland. A short Q&A will follow. We will be showing the film twice since the parsonage has limited seating. For those who can arrive early, the first seating will be at 10:30am sharp. The second viewing will be from 1:00-1:30pm. 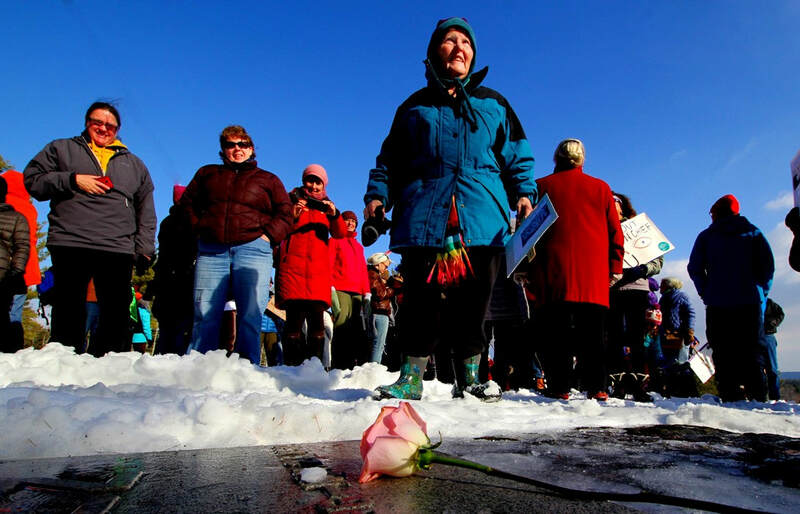 11:00am-12ish, Rally at INEZ grave and March in Lewis. 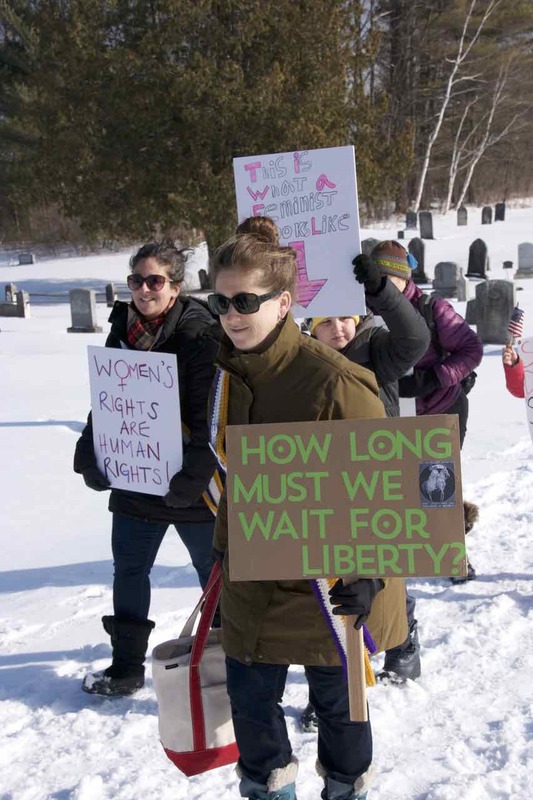 We will rally at 11:00am at the grave of Inez Milholland in Lewis Cemetery behind the Congregational Church at the intersection of US Route 9 and Fox Run Road. 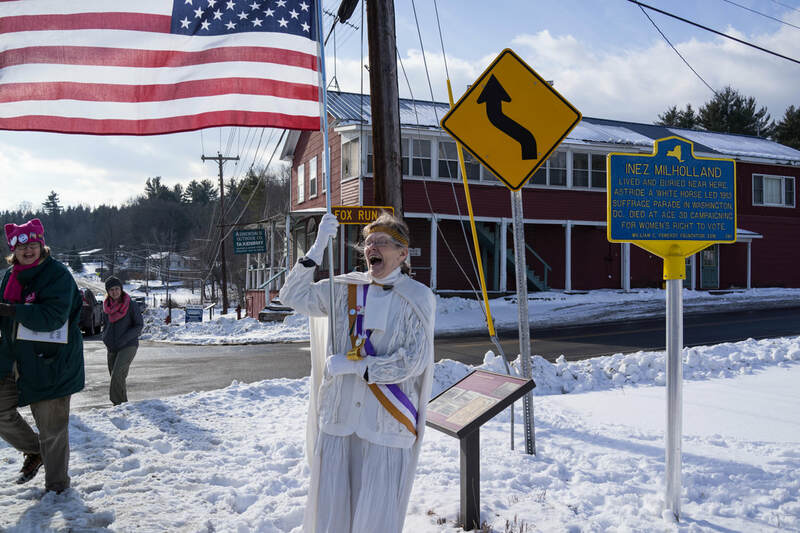 From the gravesite, we will march down the hill to the new Inez roadside marker, then up Route 9 a short distance to the new Lewis Veterans’ Memorial Park (still under construction), and back to the Congregational Church Parsonage. Lots of activities planned. 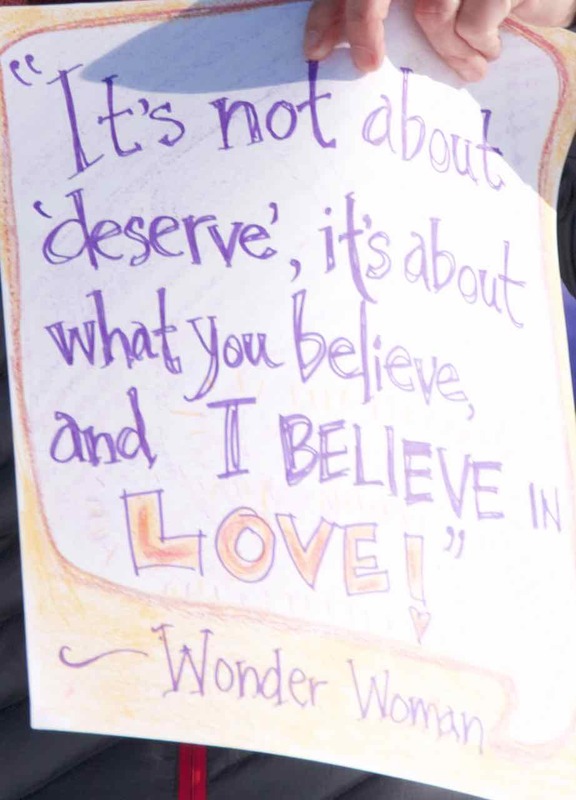 Bring your own signs, flags, and/or flowers to lay on Inez’s grave. The town hall will be open so we can view the Town of Lewis Exhibit about Inez and the Milholland family. Also, bathrooms are available here. Soup, bread, hot drinks, and other goodies will be available.